Inventory Pro Brochure - Computerized Inventory System Specialists Ltd.
keeps your business running smoothly……. Inventory Pro allows you to customize field names with a simple right click of your mouse. You can change our field names and software messages to match your industry terminology and even establish custom configurations. Each user can have their own unique startup page. User definable help menu system. 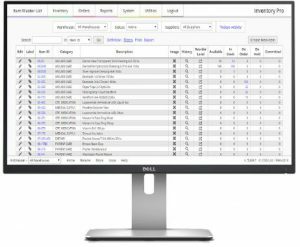 System security in Inventory Pro allows you to share information with customers, employees, and vendors while protecting the integrity of the data. You assign the read, modify, insert, or delete privileges for each user or group all the way down to the field level. Local and remote users will only have access to the data you want them to see. This built-in security allows the system to provide vendor managed inventory (VMI), e-commerce solutions, and quick orders within Inventory Pro. Inventory Pro has a standard integrated QuickBooks and Sage-50(Peachtree) accounting system. This interface is sold separately and completes a total Enterprise Resource Planning (ERP) solution. If you already have an accounting system, Inventory Pro can be customized to interface with it. Generate all the reports you need! Inventory Pro includes a robust reporting system that allows you to query virtually every aspect of the system and to format the report as your needs dictate. Plus, data is organized in a hierarchical tree format, which allows you to quickly browse an entire family of information. If you need additional reports that are not available in our standard package, no problem, you can modify the design and content of the report forms, or CISS can help you with the customizations for you. You can copy existing reports to new reports – and change the contents of the reports. Each Inventory Pro report has many sorts and filters, allowing you to specify particular data within a reporting category. Our database is Internet ready with html/ASP reporting features that show your data in real time on the World Wide Web. You can preview each report on screen and then easily print only the pages you need. Analyze data or create your own reports, graphs, and/or charts with Microsoft Excel® (csv) or other OLEcompliant applications. Print reports and all documents on letterhead that is scanned into the system or add your logo to eachreport.